I am taking a little pause in the home decorating category for this post and looking to help out my fellow home decor bloggers today. 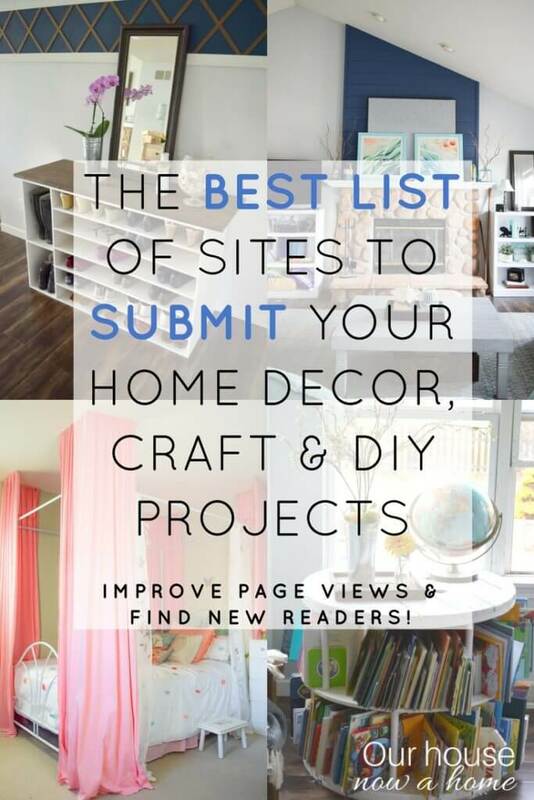 I have compiled a list of sites to submit home decor, craft and DIY projects/blog posts! This has taken me three years of knowing the business, making contacts and countless hours googling every single phrase you can think of. I got together an up-to-date and detailed list of the best places to submit home decor, craft and DIY content. When I first started my blog this is how I got people to see my blog and ideas. No one was coming to my blog organically, so I had to pull them all in one by one. I still submit to some of these now for features. It is a great way to circulate content, meet other people in the blogging and home decorating niche, and get some good Google juice with links from larger sites coming back to you. Submitting your blog posts and projects to other sites can help you get seen by a larger audience, which will increase your page views. Even if you submit something and it is denied you can use it as a learning experience to see ways you can improve your content for next time. I do want to stress that before you every submit to a web site be sure to do your own research. What kind of content do they share? Make sure it is relevant or similar to what you create, otherwise it will be a waste of time for you and them. You cant the biggest bang for your buck with any feature, and sharing content that is already proven to be a hit with a particular web sites readers is a good thing. Pay attention to their social media accounts, this is a great indicator on what the readers like and how much this community has with engagement. What is their sharing policy? Each website will have particular rules on content shared and requirements. Some even have specific steps to submit images or descriptions. Be sure to follow these rules, as that gives you a better chance to have your work featured. What is their policy on ownership of shared content? This is a big one, when first starting out with blogging I blindly submitted my projects and posts to every website that took it. I never paid attention to ownership rights. Most websites allow you to remain owner of the content you submit. But some have it worded tricky to actually allow them to use your ideas and images in anyway they want. This can mean simply social media shares, adding you to a round-up collage, or as big as selling your images for profit. Each blogger will find what their personal preference is for this. There is no right or wrong for what you feel is a good fit for your blog and your content. DIY idea center – Must have an account to submit content. Picture and description needed, provide blog post link. Will select some features to be featured in the newsletter. Remodelaholic – There is a few different ways to be featured here. They are also very involved in the blogging community and collaborate with fellow bloggers pretty frequently. Better homes and gardens, I did it! – Must send an email inquiry with feature project. Better homes & gardens, Do it yourself magazine – There is a general submission area with a few different options to submit content. Obviously with the name of the publication they are very picky with content they feature. Stumbleupon – Sign up for an account then stumble your posts. For every one of your posts you stumble be sure to stumble other blog posts as well. They do not like you to just stumble your content and will flag your account if this is done. Family handyman – Scroll to the bottom of the page and look for Content submission. Then you have to create an account. Once created you can submit projects to be featured. Craft Gawker – Must have an account to submit content. Picture and description needed, provide blog post link. Add tags with relevant content. They are very picky on picture requirements, only submit your best or you will not be approved. All Gawker sites show one image and a direct link to your blog post. Apartment Therapy – There are many different categorys to choose from to be featured, furniture makeover, room reveal, project.. all are listed and you can choose which one best fits your needs. Depending on what category you chose it what determines what information is needed. Some jsut an image and description, others just pictures and some all pictures and step-by-step instructions. Here is the home tour link and here is the project submission link. Hometalk – Must have a profile to submit content. You submit a project with a few images and a general description of the project. The key is to get people to click over to your site for more information. They do share features in newsletters and on their Facebook page, which will get your more page views. They like projects with a good before picture. DIY Home World – Picture and description needed, share a direct link to blog post. Fave crafts – Picture and description needed, share a direct link to blog post. Ikea hackers – This is obviously only for Ikea hacks. They only accept features with full step-by-step tutorial and pictures. Inspiration DIY – Picture and description needed, share a direct link to blog post. Knock off decor – Picture and description needed, share a direct link to blog post. 30 minute crafts – Picture and description needed, share a direct link to blog post. All free kids crafts – Picture and description needed, share a direct link to blog post. Craft roulette – This is really simple to submit, add your link and title. All free DIY weddings – Picture and description needed, share a direct link to blog post. Cut out and keep – Picture and description needed, share a direct link to blog post. DIY cozy home – Picture and description needed, share a direct link to blog post. Dollar store crafts – Picture and description needed, share a direct link to blog post. Decoists – They have pretty strict requirements of what they accept and want really good pictures. You send an email for a possible feature. Saved by love creations – You have to send an email with any details on project your are submitting for a feature consideration. Kenarry, ideas for the home – Brief description, link and image is needed. You can also choose from a few category’s on what the project is. iheart organizing – You can send an email to be considered for the readers space submission. This is an organized theme website so the decor should be based in that niche. Design sponge – You must send an email with the information for the project or room submission. Curbly – This one is a little different, they will pay you for a project. But you must submit the idea and it will be share in full on their site. They just want an idea of what you will create, this is more of a guest writer option instead of a strictly promotional standpoint. Inspired by this – This has a lot of requirements for the submission process. It has a beautiful website and a great community to submit to if you meet the requirements for submission. The everyday girl – You can email a story idea for possible consideration to be featured. As I said, this is all information that you can find on your own. I am not sharing any insider secrets, just trying to help some fellow home decor bloggers out. It took me a long time to get this list together and I used it on my own for years. I figured it would be valuable to other bloggers as well. I have been amazed by the support and camaraderie in the blogging world, and felt that my list of sites to submit home decor, craft and DIY projects/blog posts can be helpful to others. If you are a blogging newbie you will find your way with your blog, deciding what is best for your brand. Places you may have submitted to in the past might not work, maybe overtime their policies are not right for you. The beauty in blogging is that there is no right or wrong way to do it. Simply sharing your ideas, putting good content out there… that is it! All of the rest will come with time. If you know of a website I did not include let me know about it in the comments. I will update this when any major changes happen. This is a great list! I wrote mostly about food and party ideas, but occasionally I do home decor and I didn’t know about many of these sites. Thanks! I had no idea about most of theses. I need to bookmark this for when I have some great posts to submit!! Oh how cool is this! I love the idea of sharing your work and other people actually believing in you so much that they would feature it on their pages. So cool. I need to share my DIY Kitchen Cabinets post. It has been really popular for me without any promotion! This is such a great resource for bloggers! I guess I never really through to submit my posts to other sites – new project! This is such a great list of VERY helpful resources. I totally never knew so many of these existed. Thank you so much for sharing! Great resources not only for summiting your work but for getting ideas. thanks for sharing. Wow thank you! I need to spend time doing this! Apart from stumble upon and Apartment Therapy, I had no idea that most of these sites allowed you to submit home decor/DIY project posts! What a great roundup of resources. You have really put a ton of time and research into finding the best places. Full of wonderful information. I don’t really do a lot of DIY posts, but now I know where to look for some good DIY information in the futre. Thanks for the links. Thanks for sharing this great resource. I am not really crafty and I am not so much into DIY but I do have a friend who is an interior designer and she would love to have her work showcased. I will email her the link to your blog post. She’s going to be so happy. Thank you for this positing. Have been looking into selling a product on the net. This is certainly helpful. I need this list for parenting posts! Thanks for the great list. I have a few friends that are big crafters. I will have to share this with them. Wow this is great list. I love the idea to create list for home decor also. Thank you so much for putting together this list. I rely on Pinterest, but I knew there must be other avenues. Thank you for sharing this list of sites. I have a lot of friends and family who are into crafting and it would be cool to have sites for them to submit their ideas to. My niece has a degree in entrepreneurship and is taking special classes for interior design. This would be great news for her. Great list here which is also a great resource guide. Have bookmarked this page for future use. I had to pin this. I usually just look up on Pinterest ideas for home decor and crafts but this is a great list of resources! This is great. I am just about to post my first home decor DIY. There are lot of great places to submit this article to help with page views Thanks. This is a great list of sites. I will have to submit my craft projects to these. I’m obsessed with Apartment Therapy. Some of these are new to me so I’ll have to check them out. Thanks for the great list! I think its important for new bloggers to know that if they link up to bigger sitrs, they need to have already one opt-in to capitalize on the new readers and make sure there host can handle it. Good list, not only to submit your posts, but also to follow because you can get a lot of ideas about your own home. This is a great article for those who love and post DIY. I have a good friend that does I am going to forward your article. What a great list! I use stumble upon a lot for any article or website I think is cool! Thanks for sharing this awesome list. I normally blog about food and mommy stuff but never home decor ideas and crafts. Now that I’ve thought about it, I do want to make more crafts in my blog. This is a great list of sites to use to help with how to fix up a room or home! I just bookmarked this page! A house is transformed into a home with the right elements of home decor. This is a wonderful list to ensure that your home gets the right decor and reflects your personality. A wealth of information indeed. Thank you for this list. I am definitely bookmarking it. I have been trying to start working on a few DIY projects, and especially will definitely be doing that this summer with my kids, and now I know where to send my creations – I really appreciate the work you have done on this list! Thank you. Your list is very comprehensive and helpful. Will send this page to my contacts who may find this helpful! I have been needing this list so bad. I had no idea there were so many though! What a fabulous list of sites. You’ve put so much work in and this is a great resource! Thanks for sharing this list! I am into home remodeling, decorating.. would love to start my own project! I’ve never tried submitting anything that we or I did for home improvement. I didn’t know that there are sites that you can submit your projects to. This is awesome! Thanks for this awesome list, Emily! Oh wow! I don’t do a lot of DIY but maybe I should start! This is an awesome list! I knew about and contribute to many here, but I did not realize how many opportunities I was missing out on. 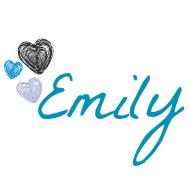 Thank you, Emily!! Emily, I am so excited for this!! I didn’t know about half of these! Thank you so much for this great post!! Great list!!! I recently opened up my blog for features and I would love to be included in your list. Thank you so much for this great post!! There are so many I didn’t know about! I will definitely check these out! Thanks for doing the homework. Very generous of you. Great list and very useful thanks for this post. This is brilliant!! OH MY GOODNESS! you are a life savor thank you!! Thank you for sharing all you hard work and time in gathering this information! I’m new to blogging and see that getting folks to your blog can be time consuming. My blog is DIY and home projects also. I look forward to reading through your posts. Thank you so much for this. This is exactly what I was looking for!!! Thanks for sharing the love!! Another place that I didn’t see on your list is Ana White’s Brag Posts. If you use any of her plans, you can submit a brag post, she has pretty high DA, so it’s a good backlink! I only knew stumble upon and inspired by this earlier. Apart from these all sites are new to me. Your list is very helpfull for all user. Thanks for sharing with us.